“Church has always given me the beacon of light when I’ve needed it,” says Martin Shanahan. A man who was widowed in 2011 will be ordained a priest for the Killaloe diocese this Sunday in the presence of his son, who will be playing the organ. Martin Shanahan will become the second married priest for the diocese when he is ordained in the parish church, St Mary’s, Mullagh at 3.00 p.m.
Born in 1948, Martin was one of a large family living near Quilty in West Clare. “I suppose back in the ’70s before I joined the ESB I was contemplating going down to the priesthood in St Patrick’s in Thurles,” he told CatholicIreland. For years Martin worked in the ESB and was always very involved in the Church. When he heard about the permanent diaconate, he discussed it with Mary. 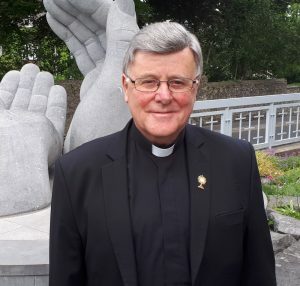 After 34 years with the ESB, he retired and took the unusual decision to begin studying philosophy and theology with the Dominicans in Tallaght, Dublin. Meanwhile, his wife Mary became ill and was diagnosed with breast cancer. She had surgery and was in remission for three years when over Christmas 2010 she began to feel very tired again. Early in 2011, they brought her to the hospital to have her checked out. “Everything was revealed to us that evening at 6.30 p.m.” An hour later, his beloved wife was dead. “For some reason, when we met, our eyes met and when we parted it was the same story. That was our goodbye,” he recalled. After Mary’s death in 2011, Martin began to think once again about the diaconate. His bishop, Kieran O’Reilly, advised him to wait two years. At the end of that time, the vocations director for the diocese told him that he would be eligible for not just the diaconate but for priesthood. After a period of discernment, Martin, as he likes to be called, chose priesthood. He had been studying with the Dominicans from 2006. In 2014 he entered Maynooth. In 2016 he graduated in philosophy and theology from the Priory Institute. “They fast-tracked me out [at St Patrick’s] for the three years.” In October 2017 he came to Ennis for his pastoral experience, where he lives in the parish house adjoining the cathedral. Meanwhile, his son Eoin, who will be playing the organ on Sunday, is studying for his Masters in Geography at NUI Maynooth. When his father broke the news to him some years ago that he was hoping to become a Catholic priest, it was “a bit of a shock”. Martin believes that his son worried about what the reaction of his aunts and uncles (Martin’s siblings) would be, but in the end “he was happy enough”. The Rev. Mr Shanahan, whose health is “very good”, is not phased at the thought of becoming a priest late in life and at such a difficult time for the Church in Ireland. “I think from my own experience that the Church has been very supportive of me. It has always given me the beacon of light in my life when I needed it. That’s how I found all the ingredients I needed for my life at the time in the Church,” he said. He will live wherever he is assigned as priest and says he has no idea what or if he will be paid – but he’s not worried about it.